Saying, There was in a city a judge, which feared not God, neither regarded man: And there was a widow in that city; and she came unto him, saying, Avenge me of mine adversary. And he would not for a while: but afterward he said within himself, Though I fear not God, nor regard man; Yet because this widow troubleth me, I will avenge her, lest by her continual coming she weary me. And the Lord said, Hear what the unjust judge saith. And shall not God avenge his own elect, which cry day and night unto him, though he bear long with them? I tell you that he will avenge them speedily. Nevertheless when the Son of man cometh, shall he find faith on the earth? Thou hast shown forth thy watchfulness/ and wast a fervent preacher of godliness:/ by the wisdom of thy teachings thou dost gladden the Church's faithful./ Righteous Father Gregory,/ entreat Christ our God to grant us His great mercy. 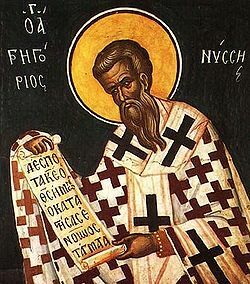 Thou wast entrusted with the care of the flock of Christ,/ as one pure and filled with divine Light./ Thou didst adorn the vesture of thy priesthood with asceticism and many miracles./ Thou wast a foremost Hierarch of the Church,/ O righteous Father Dometian. Godly adornment of the righteous,/ thou art a steward of Christ's mysteries/ and a living temple of the light-creating Trinity:/ thou didst raise up churches to the glory of God, O Holy Marcian,/ and didst worthily attain to glory on high. Watchful with the eyes of thy soul/ and a vigilant shepherd for the world,/ with wisdom and thy fervent intercession thou didst drive off heretics like wolves,/ keeping thy flock unharmed. Dometian, adornment of Hierarchs,/ thou didst shine forth in Christ's Church/ as a vessel of the Holy Spirit./ By the grace of the priesthood/ all saw thee to be venerable by thy virtue. Holy Marcian, thou didst live righteously on earth/ and wast a living vessel of divine Light./ Having blamelessly served the Lord as a priest,/ thou art rejoicing with the Angels in heaven.